Retail is reinventing itself. It is not just about buying merchandise anymore, customers are looking to be delighted with a great shopping experience. Online shopping helps provide convenience and maybe even lower prices, however, it is not able to provide the same experience the customers get in physical stores. The comfort of high-quality noise-canceling headphones or the fit of a soft fleece jacket is unparalleled compared to not being able to touch and feel the product online before you buy them. A recent article in Chain Store Age, citing a Profitect survey, discussed how Gen Z shoppers like physical stores and in some cases they even prefer it to eCommerce. According to the survey, about 42 percent of the respondents prefer to shop in-store vs. online. In addition, 34 percent of these Gen Z shoppers prefer to buy online and in-store equally. This shows that while eCommerce is gaining popularity, physical stores still hold a lot of relevance in the minds of the young consumers. The report also mentions that Gen Z customers prefer physical stores which are conveniently located to them. When choosing a store to shop at, an accessible location can influence 48 percent of the respondents. 65 percent of the respondents also feel that going to the physical store is the most convenient way to return any merchandise than shipping them. Physical stores have been the backbone of the retail economy in the U.S. for a long time. Even though there might be a perception that the Gen Z shoppers prefer buying online, they choose physical stores for very different purposes. This means that merchants need to do more to attract shoppers (young or old) to their stores. The shopping experience should ideally begin even before customers enter the store. As an example, merchants can use mobile couponing via connected screens to attract these shoppers to visit their stores. Gen Z’s preference for offline retail tells us is that physical stores are still relevant no matter how old the consumers are and that a great shopping experience can go a long way. One of the other aspects that caught my eye was the statistics on the effects of sales associates in the store. According to the Profitect survey, 11 percent of the respondents said that they considered in-store experts who are helpful as one of the biggest reason to shop at a specific retail store. 19 percent of respondents also felt that in-store sales associates prompt them to add more items to their shopping cart. While these responses seemed relatively low, 57 percent said that poor customer service is one of the reasons why they would stop shopping at a specific retail store. Providing a positive shopping experience for its customers is a big priority for any retailer. According to a recent research report by Forrester, when customers have excellent experiences while shopping, 96 percent of them are likely to stay longer at the store, 92 percent will spend more and 95 percent will recommend the store to others. A great way to achieve this “excellent experience” is by empowering sales associates with mobile technology, which can go beyond providing just allowing the customer to pay in aisle. With access to internal data about most popular products, or even the least returned ones, sales associates can provide information to the customer that can potentially help them make a purchasing decision or even convince them to buy complementary items. Once the customer is ready, the associate can easily accept payment right from the point of service. While online shopping has been on the rise in the past few years, physical stores have the potential to provide customers with a stronger, more personal shopping experience. Customers are not only able to touch and feel the products when they are in the store, but merchants can provide them valuable insights that help close the sale. No matter the age group of your target audience, a good customer experience not just helps generate revenue but creates brand loyalty. 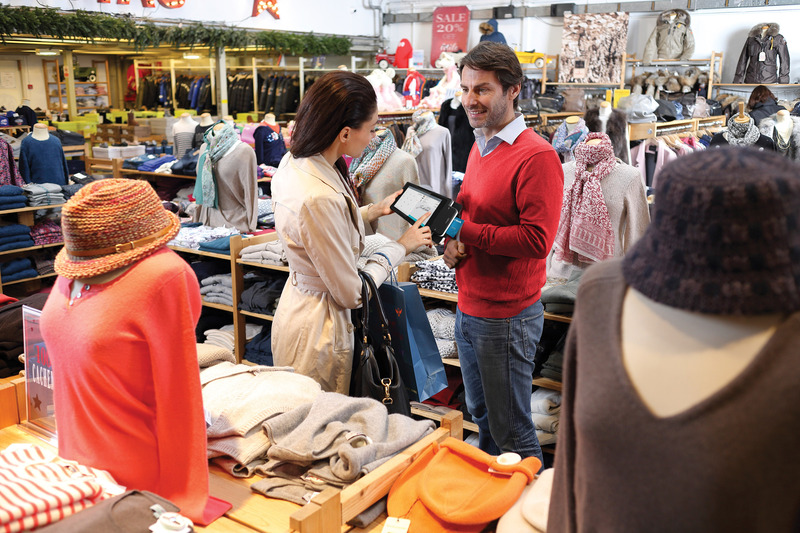 Enhance your customers’ retail shopping experience with mobile technology. Learn more about our latest mobile point of sale (mobile POS) solutions by downloading our playbook.